SIGNARAMA has a variety of Menu Boards and Menu Systems for indoor and outdoor applications. Whether you’re looking for an interchangeable letter board, an illuminated cabinet, or a digital display, we have the perfect solution for you!Menu Boards are an integral part of a retail business. Popular applications are salons, retail stores, restaurants, and order processing centers just to name a few. Menu boards can be customized with your logo, distinctive letter style, headers and text placement. SIGNARAMA has Menu Systems in a wide variety of shapes , sizes and colors to fit your needs. 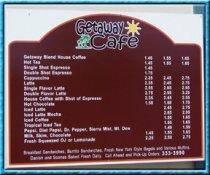 We also can fabricate custom menu boards using a variety of materials and techniques. Digital Menu Boards are highly effective at promoting specials and key items in your business. SIGNARAMA offers many options of Digital Displays. These displays can be programmed to display your unique message consistently throughout your business day. Digital Displays are the perfect solution for drawing the attention of waiting customers to products they may not know of. This is done by using motion, video, photographs, and special video effects. Digital Menu Boards are also used for processing orders in manufacturing and restaurant industries. Call SIGNARAMA today and let our sign professionals help you pick which Menu System will work best for you!